It has become evident that nonlymphoid tissues are populated by distinct subsets of innate and adaptive lymphocytes that are characterized by minimal exchange with recirculating counterparts. Especially at barrier sites, such as the skin, gut, and lung, these tissue-resident lymphocyte populations are ideally positioned to quickly respond to pathogens and other environmental stimuli. The kidney harbors several classes of innate and innate-like lymphocytes that have been described to contribute to this tissue-resident population in other organs, including innate lymphoid cells, natural killer cells, natural killer T cells, mucosal-associated invariant T cells, and γδ T cells. Additionally, a substantial proportion of the adaptive lymphocytes that are found in the kidney displays a surface phenotype suggestive of tissue residency, such as CD69+CD4+ T cells. In this review, we summarize recent advances in the understanding of tissue-resident lymphocyte populations, review the available evidence for the existence of these populations in the kidney, and discuss the potential physiologic and pathophysiologic roles thereof in kidney. Although both innate and adaptive lymphocytes can establish a state of residency, there are important differences in the pathways that lead to their retention in the tissue.4,11,12 After initial activation in secondary lymphoid organs, conventional T cells infiltrate the inflamed site as differentiated effector cells in response to local production of chemoattractants and then, persist in the tissue after the initial stimulus has resolved. As elegantly shown in a murine model of viral skin infections, the key advantage of such a persisting pathogen-specific T cell population in the tissue is that it can provide rapid protection from locally recurring infections with the same pathogen.13 It is remarkable that the protection provided by these tissue-resident memory T (Trm) cell populations is much more effective than the protection conferred by recirculating effector memory T cells and central memory T cells that reside in lymphoid organs.10,13 In contrast to adaptive lymphocytes and as indicated by the term “innate,” many innate and innate-like lymphocyte subsets have been shown to populate peripheral tissues in the absence of inflammation during fetal development or in early postnatal life.3,14–16 In the tissues, they can renew locally by homeostatic proliferation or potentially develop from local hematopoietic progenitors.3,16 The early appearance of these innate lymphocyte subsets in nonlymphoid tissues makes it conceivable that some of them play crucial roles for organ homeostasis, development of mucosa-associated lymphoid tissues, and defense against congenital or intrauterine infections.6,7,14 Of note, recent studies indicate that, within nonlymphoid organs, including the kidney, resident lymphocytes might greatly outnumber their recirculating counterparts,17 underlining their critical importance for the local immune response in disease and homeostasis. The term “tissue-resident” implies that these lymphocyte populations show a minimum of exchange with their counterparts that recirculate in the bloodstream, lymphoid organs, and the peripheral tissues. Although easy to define, it is indeed complicated to prove tissue residency of an immune cell population of interest in animal experiments or even humans. The marker CD69 identifies most tissue-resident conventional T cells in the kidney. For staining of intravascular leukocytes, naïve C57BL/6 mice were injected intravenously with a fluorochrome-coupled antibody against the panleukocyte marker CD45 5 minutes before euthanasia (CD45 i.v.). After enzymatic digestion and mechanic dissociation of the kidney tissue, leukocytes were isolated by Percoll density gradient centrifugation as previously described35 and stained with a combination of antibodies to identify CD4+ and CD8+ T cells as well as the expression of the tissue retention marker CD69. 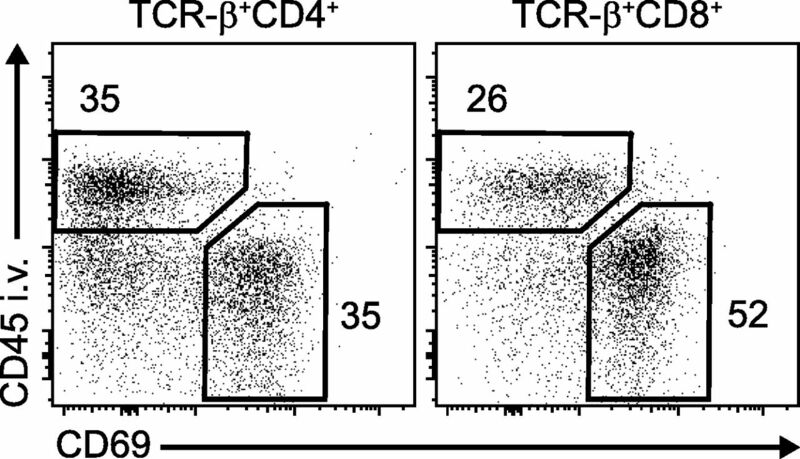 Flow cytometry plots are representative for three independent animals with similar results and show that, consistent with a Trm phenotype, a majority of CD45 intravenous negative T cells were CD69 positive. TCR, T cell receptor. The problem of functionally defining immune cell tissue residency in humans was elegantly addressed in two recent studies that analyzed blood and skin samples of patients with cutaneous T cell malignancies before and after treatment with the T cell–depleting antibody alemtuzumab (αCD52).25,26 The authors could show that alemtuzumab selectively depleted malignant and normal T cells from the circulation but did not affect noncirculating T cells with a Trm phenotype that reside in the skin.25 Further characterization of these skin-resident T cells in patients depleted of recirculating T cells and a human skin–engrafted mouse model revealed that CD69 is indeed a valid marker for Trm cells in the human skin. In contrast to the mouse skin, however, where CD8+CD69+CD103+ T cells represent the most prominent Trm population, CD4+CD69+CD103− Trm cells seem to be more frequent in humans.26 These first functional studies in humans clearly show that the concept of long-term residency of certain T cell subsets in the skin and most likely, other organs as well is also valid in human immunology. Diverse innate, innate-like, and adaptive subsets have been shown to contribute to the tissue-resident pool of lymphocytes in different organs (Figure 2). A few years ago, conventional CD8+ and CD4+ T cells that show a memory phenotype and establish long-term residency in nonlymphoid tissues were identified and termed Trm cells.11,12 These Trm cells differ in phenotype, gene expression profile, and function from other T cell subsets. There is indication that CD4+ and CD8+ Trm cells can be further subdivided into distinct populations and that the composition of these Trm cell populations varies between different peripheral tissues.24 The origin of these subpopulations and their relation to “conventional” T effector or T memory cell subsets (i.e., TH1, TH2, TH17, and Treg cells) are still unresolved questions. Innate, innate-like and adaptive lymphocytes contribute to the tissue-resident population in different organs. CD4+ and CD8+ T cells can be activated by ligation of their T cell receptor by peptide-loaded MHC proteins on the surface of antigen-presenting cells in conjunction with costimulatory molecules and cytokine signals. The γδ T cells, NKT cells, and MAIT cells have a T cell receptor with a restricted specificity. As innate-like T cells, they display a “preactivated” phenotype and can be activated via T cell receptor ligation or directly by cytokine signals. 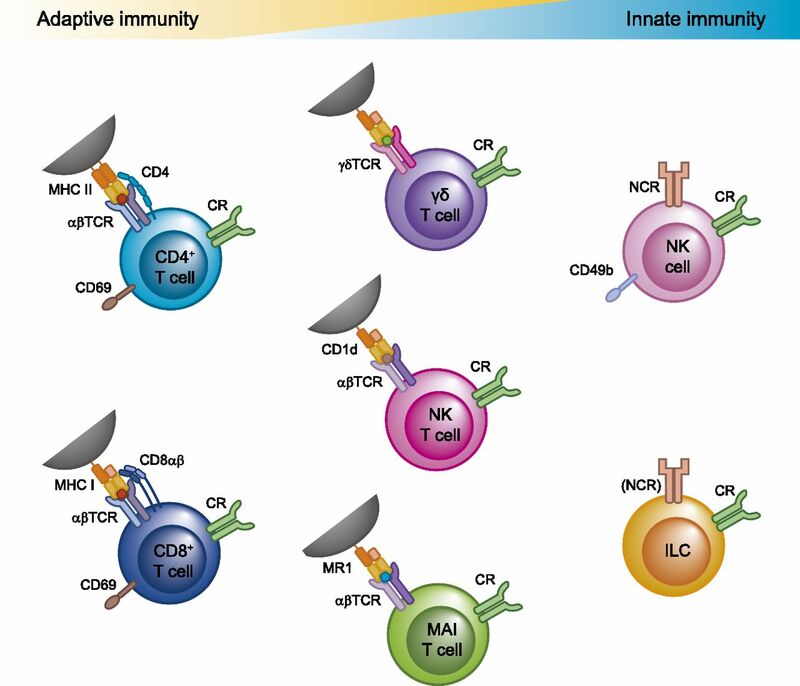 Conventional NK cells and “helper-like” ILCs are grouped together as ILCs and can be activated by direct recognition of damaged cells via natural killer cell receptors (NCRs) and/or cytokine signals (cytokine receptors [CRs]). TCR, T cell receptor. The γδ T cells, invariant natural killer T (iNKT) cells, and mucosal-associated invariant T (MAIT) cells belong to the innate-like T cell subsets that display features of both innate and adaptive immunity. They express T cell receptors with a restricted variance that can recognize nonpeptide antigens, such as phosphoantigens (γδ T cells), lipids (iNKT cells),14 or vitamin B2 (riboflavin) metabolites (MAIT cells),27 that can be endogenous or microbe-derived metabolic products and are presented in the context of specific MHC-related proteins.14 However, these T cell subsets show a preactivated state and can be activated independently of T cell receptor (TCR) ligation directly by cytokine signals or pattern recognition receptors. Although a limited number of studies formally addressed kidney-residing lymphocyte populations (Table 1), several reports showed the existence in the kidney of innate and adaptive lymphocytes that show properties consistent with tissue residency. In this section, we will summarize the current knowledge of tissue-residing lymphocyte subsets in the kidney and relate the studies conducted in experimental mouse models of kidney disease to the available data from healthy human kidney tissue and kidney biopsy samples of patients with renal diseases. Characterization of tissue-resident leukocytes is currently based on multicolor flow cytometry. Because classic immunohistochemical staining is often not sufficient to identify tissue-resident leukocyte subsets, there is only limited information on the precise localization of cells within the kidney The establishment of new techniques, such as multicolor histocytometry29,30 and flow cytometry of selected parts of the kidney (e.g., medulla versus cortex), might allow us to study the localization of tissue-resident leukocytes within the kidney and their interaction with the local environment in the future. Tissue-resident lymphocytes are likely to play important roles in renal disease. Graphic summary of the so far identified functions of potentially tissue-resident innate, innate-like, and adaptive lymphocyte populations in AKI induced by ischemia and reperfusion,32,36,40,45,65,66,73 crescentic GN,44,48,51,57–59 and chronic progression of kidney disease.34,35 The tissue residency of a subset of NK cells32 and the presence of conventional Trm cells8,17,72 in the murine kidney have been clearly shown (Table 1). Given the results from other organs, the existence of kidney-resident subsets among renal γδ T cells, ILCs, NKT cells, and CD4+ T cells can be assumed. However, the formal experimental proof of this hypothesis is still lacking. Red arrows depict proinflammatory mechanisms that promote disease progression, whereas green symbols represent anti-inflammatory effects that dampen tissue damage. AAM, alternatively activated macrophages; DN T, double-negative T cell, Treg, regulatory T cell. Importantly, also leukocytes isolated from the healthy human kidney contain a large fraction (up to approximately 25% total of lymphocytes) of NK cells identified as CD3negCD56+CD94+, indicating that the mechanisms used by mouse kidney–residing NK cells in AKI might be translatable to human disease.33 Another very recent investigation of kidney biopsies from patients with different forms of renal diseases revealed that a large fraction of intrarenal NK cells expresses the tissue residency maker CD69 and produces IFN-γ. Moreover, NK cells accumulated in the tubulointerstitial compartment of fibrotic kidneys and were correlated with degree of fibrosis and loss of kidney function in these patients, suggesting that NK cells might play a role in progression of kidney fibrosis.34 Especially in the face of these new results in patients with renal disease, a potential role of tissue-resident NK cells in inflammatory and fibrotic kidney diseases warrants additional study. Recently, our group performed a comprehensive characterization of helper-like ILC populations in the healthy murine and human kidney, showing that IL-13– and IL-5–producing type ILC2s are a major kidney-residing ILC population in both species.35 However, long-term tissue residency of ILCs in the kidney has not yet been formally addressed. As shown before in other organs,6,7 expansion and activation of ILC2s in the kidney can be induced by application of the epithelial cell–derived cytokines IL-2536 or IL-33.35 In ischemic AKI, the preemptive therapy with IL-25 protected mice from renal injury by ILC2-mediated induction of alternatively activated macrophages. In vitro experiments showed that this “M2 activation” of macrophages depends on IL-4 and IL-13 secreted by ILC2s and that these macrophages can directly promote the survival of tubular epithelial cells.36 In Adriamycin-induced glomerulosclerosis, a model for chronic proteinuric kidney disease, the treatment of mice with IL-33 improved the clinical course of the disease by ILC2-mediated induction of a protective type 2 response.35 In addition to promoting alternative activation of macrophages, as described in the AKI model, the IL-33–expanded ILC2s produced large amounts of IL-5, which induced the accumulation of eosinophils in the kidney, ameliorating glomerulosclerosis. Via a yet unknown mechanism, ILC2 expansion also reduced the infiltration of pathogenic neutrophils and γδ T cells into the kidney, resulting in less tissue injury.35 In this context, it is important to mention that IL-33 is a pleiotropic cytokine37 that can also influence T helper cell and regulatory T cell responses in the kidney,38–40 but if these IL-33–responsive CD4+ T cell subsets show characteristics of tissue-resident cells has not been addressed so far. Together, this suggests a protective role for tissue-resident ILC2s in the kidney. A potential function of helper-like ILC subtypes in other animal models of renal disease and human kidney pathology remains to be elucidated. Taken together, experimental and human studies support a biologic function of γδ T cells in the pathogenesis of several inflammatory kidney diseases. However, the contribution of tissue-resident γδ T cells in this context, their potential protective role against invading pathogens, and the role of different γδ T cells subsets are so far unknown and require further study. Natural killer T (NKT) cells and MAIT cells represent two distinct subsets of T cells that recognize nonpeptide antigens and account for a significant fraction of tissue-resident lymphocytes in various organs.56 However, whether subsets of NKT and MAIT cells establish long-term tissue residency in the kidney has not been studied so far. So far, most studies on NKT cells in the field of nephrology focused on their role in autoimmune kidney diseases (Figure 3). In experimental models of crescentic GN, three studies showed that lack or reduction of iNKT cells aggravates the clinical course of the disease, whereas activation of iNKT might ameliorate GN.57–59 The mechanisms by which “regulatory” iNKT cells protect against autoimmune diseases, such as GN, remain to be fully elucidated but likely involve the local (and systemic) production of immunomodulatory cytokines, such as IL-4, IL-10, and TGF-β, all of which have been shown to be protective in immune-mediated kidney diseases.57–59 In addition, abnormalities in the number and function of NKT cells have been detected in patients with SLE and lupus-prone mouse strains (MRL/lpr, NZB/W F1).60 iNKT cell activation by α-GalCer treatment alleviated inflammatory dermatitis without affecting kidney disease in MRL/lpr mice.61 In young NZB/W F1 mice, brief α-GalCer treatment protected against systemic autoimmunity and proteinuria,62 and in line, the lack of functional NKT cells in CD1d−/− mice exacerbated lupus nephritis induced by the hydrocarbon oil pristane.63 However, the repetitive application of α-GalCer in adult NZB/W F1 animals exacerbated TH1 responses and autoantibody secretion that contribute to lupus development,64 suggesting that continuous NKT cell activation can promote autoimmune inflammation. In a model of renal IRI, Okusa and coworkers65 reported that absence of NKT cells achieved by application of depleting antibodies or in mice deficient of iNKT cells (Jα18−/−) markedly attenuated renal damage (Figure 3). These effects were associated with a significant decrease in renal leukocyte infiltration and a reduction in IFN-γ–producing neutrophils, suggesting that iNKT cells mediate tissue damage in this model.65 In contrast, Yang et al.66 showed that the severity of IRI in mice deficient in iNKT cells (Jα18−/−) and particularly, mice with nonfunctional types 1 and 2 NKT cells (CD1d−/−) was aggravated. In support of a renoprotective function, the number of NKT cells in the renal tissue of patients with acute tubular necrosis tended to be negatively correlated with disease severity.66 The severity of IRI was quite different between the two studies (i.e., in the former report,65 the peak serum creatinine at 24 hours was 0.7 mg/dl compared with 1.59 mg/dl in the study by Yang et al.66), suggesting that the severity of injury might influence iNKT cell function in IRI. Moreover, the renoprotective effect in the latter study was mainly induced by sulfatide-reactive type 2 NKT cells, which were not analyzed by Li et al.,65 indicating that different NKT cell types might have contrasting immune regulatory function in the setting of ischemic injury. MAIT cells represent another innate-like T cell subset characterized by the recognition of riboflavin metabolites in context with the MHC-related molecule 1. On activation by TCR ligation and/or cytokine signals, they can rapidly produce a range of proinflammatory cytokines, suggesting that they might be linked to chronic inflammatory disorders in various tissues.68 Although abundant in mucosal tissue, liver, and the peripheral blood in humans, they are relatively rare in mice. A first indication that MAIT cells can be found in the human kidney was provided by a study that showed the presence of MAIT cell–specific invariant Vα7.2-Jα33 TCR sequences in eight of 11 kidney tumors.69 Later, a quantification of MAIT TCR transcript levels among various tissues revealed that the kidney shows a substantial expression of these transcripts. Indeed, in the kidney, MAIT TCR sequence levels were comparable with the liver and much higher than in the peripheral blood.70 However, the location of MAIT cells in the kidney, their functional profile, and a potential role of these cells in kidney diseases await further study. Importantly, quantitative immunofluorescence microscopy recently revealed that conventional FACS-based assays highly underestimate the T cell numbers in peripheral tissues, including the kidney.17 Using this method, a >20-fold higher number of Trm cells was calculated for the murine kidney.17 It also needs to be considered that mice are usually kept under specific pathogen–free (SPF) conditions and therefore, have an almost virgin immune system. The number of CD4+ and CD8+ T cells that could be isolated from the kidneys of mice bred under germfree conditions was found to be similar to that of SPF mice.74 However, when mice from pet stores or free living populations were compared with SPF mice, significantly higher numbers of T cells could be isolated from the kidney and other peripheral tissues.75 This indicates that the microbiota is not absolutely required to generate kidney-resident T cells, but it clearly shows that the wide array of pathogens that free living mice (and humans) are exposed to contributes to the generation of the tissue-resident T cell population. Therefore, the currently available data for renal Trm cells derived from mice might not fully reflect the situation in the human kidney. In the mouse, several bacterial and viral infection models show accumulation of pathogen-specific CD8+ Trm cells in the kidney.8,17,71,76 At least some of these pathogens (i.e., Listeria monocytogenes and lymphocytic choriomeningitis virus) transiently or chronically infect the kidney. In these models, CD8+ T cells become activated in secondary lymphoid tissues and acquire the chemokine receptors and adhesion molecules that allow transmigration through the activated endothelium into the infected kidney tissue. Within the tissue, a subset of CD8+ T cells differentiates to long-lived sessile CD8+ Trm cells that remain after clearance of the infection. In the kidney, TGF-β was shown to control the tissue entry of effector T cells and thereby, participate in the development of a kidney-residing Trm cell population.71 Other cytokines, such as tumor TNF-α, IL-33, IL-15, and TGF-β, have been identified as factors that induce CD8+ Trm cell formation in various tissues,72,77 but their exact role for kidney residency of T cells remains to be elucidated. CD8+ Trm cell differentiation in the kidney also depends on expression of the transcription factors Blimp1 and Hobit and downregulation of the transcription factor KLF2.72,78 Mechanistically, Hobit represses Klf2 and S1pr1 expression (coding for KLF2 and sphingosine phosphate 1 receptor 1), and both Blimp1 and Hobit bound target sequences within the S1pr1 and Ccr7 gene.78 KLF2 induces the expression of sphingosine phosphate 1 receptor 1, which together with the chemokine receptor CCR7, coordinates the egress of lymphocytes via lymphatic vessels.72 The factors that allow long-term survival of CD8+ Trm cells in the kidney tissue and especially, the signals that promote CD4+ Trm cell formation and survival in peripheral tissues are still unclear. Trm cells are also found in kidneys of mice without prior renal disease, which could be the consequence of a subclinical renal inflammation or infection. However, activated CD8+ T cells are capable of trafficking nonlymphoid tissues, even in the absence of local inflammation,8,79 presumably also allowing activated T cells to home to the kidney. Thus, the population of Trm cells in the kidney might be due to prior renal inflammations but could also reflect responses at nonrenal sites. This scenario is in agreement with the large number of renal Trm cells in pet store mice75 and might also apply for human renal Trm cells. In nonbarrier tissues and particularly, the kidney, the function of Trm cells is still unclear. In the human kidney, Trm cells might be involved in control of urogenital bacterial infection ascending to the kidney. It is also possible that Trm cells are required to control latent chronic infections (e.g., by polyoma viruses). In sterile inflammatory diseases and autoimmunity, Trm cells could make up a population of autoreactive T cells directed against renal antigens, or by antigen-independent pathways, they could amplify inflammatory responses and thereby, aggravate renal damage. A determination of the TCR repertoire and specificity of renal Trm cells will help to identify the function of these cells in renal disease. From a clinical point of view, the understanding of the pathways that regulate the formation and localization of resident lymphocytes and the tissue-specific factors that control their activation is especially important in vaccine development and designing new strategies for treatment of chronic inflammatory diseases. Given the key features of the tissue-resident lymphocyte populations, it is likely that they play a critical role in tissue-specific inflammatory diseases of both barrier and nonbarrier organs, such as the kidney. J.-E.T. is supported by Emmy Noether Grant TU316/1-2 of the Deutsche Forschungsgemeinschaft. J.-E.T., H.-W.M., and U.P. are supported by the Collaborative Research Center 1192 “Immune-Mediated Glomerular Diseases” funded by the Deutsche Forschungsgemeinschaft.